Mercer County Judge Mary Jacobson ruled last month that Princeton has added far too few affordable homes. To meet state affordable housing requirements, Princeton Council is now secretly developing plans for around 3,000 new homes, a radical increase in development which is likely to take many people in the town by surprise. How many homes are we talking about? And where should they go? Local Princeton media has widely reported that the town must allow for 753 units of affordable housing. This is the number that Judge Jacobson decided is the legally-required minimum for the town’s ‘Fair Share’ obligation for the years 1999-2025. Princeton has already built 254 of the required 753 units, however. Developments such as the Avalon Bay apartments at the old hospital site (see photo at top), which includes 56 affordable units, will count toward Princeton’s housing obligation. However, the former Borough has an unmet housing need of at least 220 units, which dates from the 1990s. Fair Share Housing Center, the New Jersey non-profit that aims to ensure compliance with state fair housing laws, has indicated that it intends to make sure Princeton fulfills this obligation. The town may try to fight in court to cancel this unmet need for affordable housing, but based on past experience, they may not be successful. That means that that the town really does have to plan for somewhere in the region of 750 new affordable homes. 2. Princeton Governing Body Aims for ‘Inclusionary Zoning’. Princeton Council spent over 90 minutes discussing the affordable housing issue withe town lawyers on Monday night, April 9, 2018. This discussion was held in ‘closed session’, which means that the public is excluded. 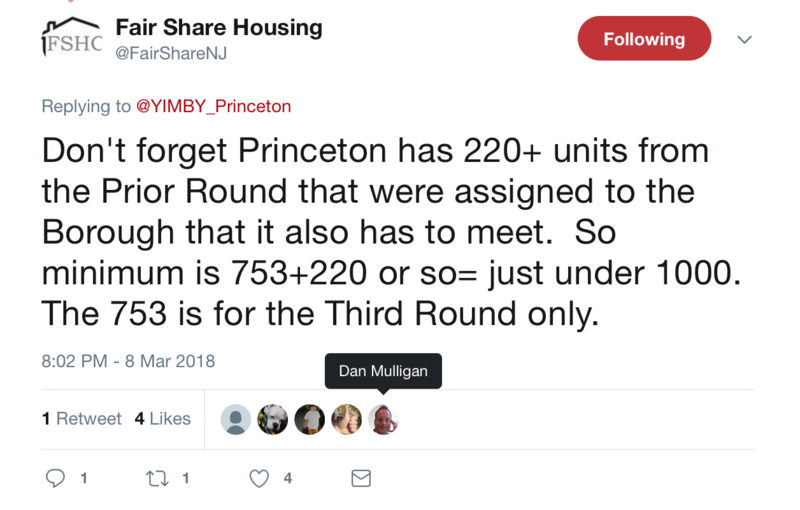 When regular public session resumed, members of the ‘Princeton Progressive Action Group’ asked members of the Princeton Governing Body about when they planned to consult the public about their plans for affordable housing? Mayor Lempert said that because the town is trapped in its unsuccessful strategy of litigation against affordable housing, they could not discuss housing plans in public, but that they hoped to do so ‘soon’. In response to a question from Princeton Council candidate Surinder Sharma, town adminstrator Marc Dashield made a revealing remark about the town’s plan to satisfy its affordable housing obligation. According to Dashield, the town will add most of its new affordable housing as ‘inclusionary zoned’ units. That means that the town will allow developers to build new housing in town, as long as 20% of the new homes are designated ‘affordable’, and count toward the town’s housing obligation. Of course, if the town needs to build 750 units of affordable housing, and those units make up just 20% of newly-built housing, then Princeton is looking at 3,500+ new homes by 2025. The town of Princeton is required, by court order, to release its plans for affordable housing compliance by June 22. By that time, both Council and the Princeton Planning Board must approve the proposed housing plan. But members of the public have yet not been consulted in any way. That is likely to prove extremely controversial, as Princeton residents find out that hundreds or even thousands of new homes are being planned for their neighborhoods. On the other hand, adding a large amount of new housing is likely to open up opportunities for a wider range of people to move to Princeton, especially as 20% of the units will be ‘affordable’ homes, which have rents based on the tenant’s available income, instead of the market rate. Overall, new housing is likely to be a good thing, supporting downtown stores, and providing a broader tax base to pay for expensive municipal expenditures such as the planned $3 million ‘cold storage facility’. Affordable residences at Princeton Housing Authority’s Clay Street site are close to downtown (click to expand). The challenge for Council is to make new growth fair. Mayor Lempert has spoken of a ‘Smart Growth’ plan for housing. ‘Smart Growth’ means that new development is concentrated near existing stores, workplaces and amenities, and limits sprawl and loss of green spaces. This is to be applauded. On the other hand, a ‘Fair Growth’ plan would ensure that development is spread equally through the town. In recent years, the Witherspoon corridor has seen much development at the Merwick-Stanworth site and at the Hospital Site. Can Council ensure that other neighborhoods pick up their share of new development? 4. A role for the University? 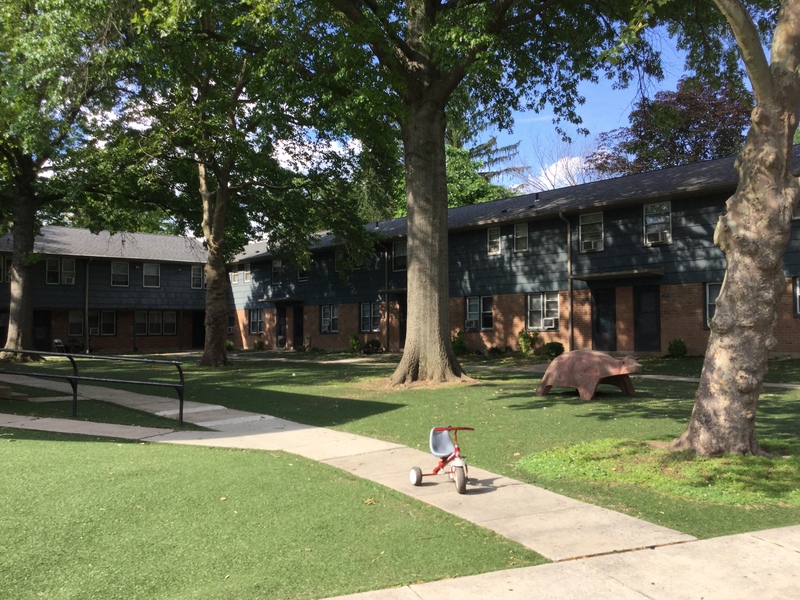 As one of the largest land-holders in town, Princeton University is likely to be a partner for future municipal plans for affordable housing. The University has long been rumored to be planning redevelopment of the area south of the new Princeton ‘Dinky’ Station on Alexander Street. This could be an important site for new affordable housing. The Butler Tract, next to the Riverside neighborhood, is another large, attractive site for new affordable homes. Looking further ahead, the University plans to build on Springdale Golf Course. Could this be a site for affordable housing? Although Council is likely already discussing housing opportunities with Princeton University, it’s not obvious what the benefit is for the local college. According to the University’s 2025 campus plan, there are no imminent plans to redevelop the Butler Tract, and Springdale Golf Course will remain for at least 10 more years. That’s not going to help the town meet a housing obligation with a deadline of 2025, but these remain the largest buildable areas in town. 5. What about the public schools? Princeton School Board is planning a bond referendum, which would raise a lot of money to expand the high school and establish a new ‘pre-middle’ school, at great cost to the Princeton taxpayer. Even if the referendum is passed, it’s not clear that the expansions would be sufficient if 3,000 new homes are built in Princeton. Ultimately, the School Board may need to consider more signifiant steps. One possibility is that more students could be educated at the Charter School, or even at a new Charter High School. Another possibility is that Princeton students could be issued vouchers to attend nearby private schools, reducing the pressure on public schools. As the town continues to grow however, we have to seriously consider whether at some point it becomes necessary to build a second high school. If so, the possibility of regionalizing the School Board, to merge with nearby districts in West Windsor, Montgomery, or South Brunswick becomes appealing. 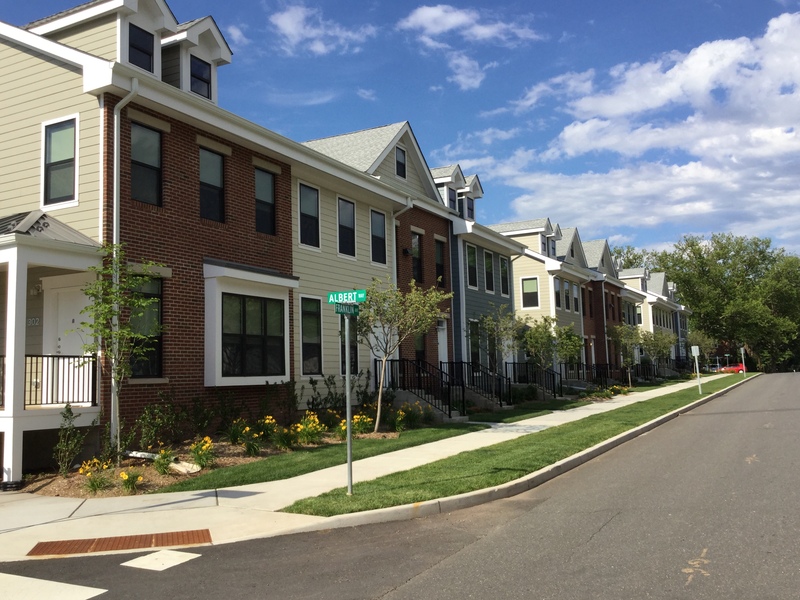 Like Princeton, these towns are all adding large numbers of new affordable housing units. Like Princeton, they are going to struggle to find space for the new students. Would a broader, regional school board be better equipped to handle future population growth? The impending housing plan is, for sure, the biggest issue that the town of Princeton faces. If Council does a good job, then it will strengthen Princeton’s downtown and provide more homes that are near transit, and which offer easy access to the best things in town on foot or by bike. With zero public consultation, however, there is a risk that Council is going to get it wrong, or that local residents are going to get very upset. Given the difficulties of finding places in Princeton to put 3,000 homes, it’s possible that Council will look for a legal tactic to buy more time. We will find out by June 22. This entry was posted in Affordability, Density, Local, People, Placemaking, planning, Smart Growth, Zoning and tagged Affordable housing, planning, Princeton. Bookmark the permalink.